The Cagayan Electric Power & Light Co., Inc. (CEPALCO) would like to inform all customers of a SCHEDULED POWER INTERRUPTION on Sunday, October 29 2017 as shown below. 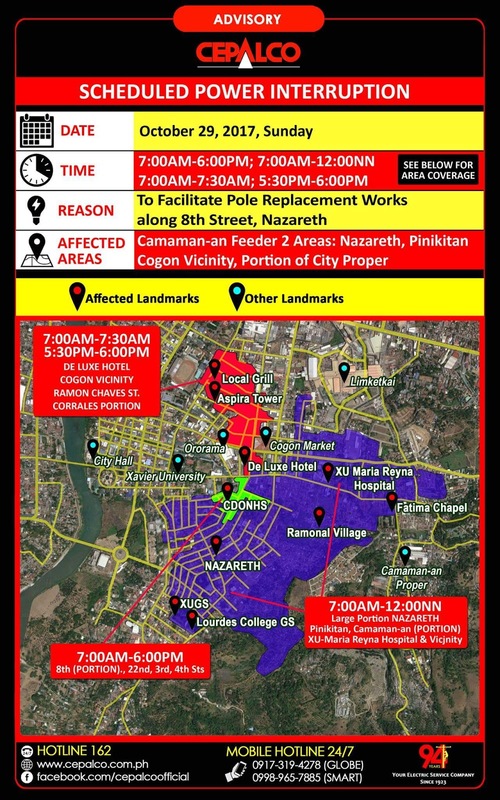 REASON : TO FACILITATE POLE REPLACEMENT WORKS ALONG 8TH STREET, NAZARETH. 1. Along Hayes St. from Camaman-an Fatima Chapel towards along Capt. Vicente Roa St. up to corner Justo Ramonal Ext., including Pinikitan, Adela, Balangiao area, Demetrio Velez St., Quirino St. and Yacapin Ext. 2. Along J. Ramonal Ext. from corner Quirino St, Sto. Niño, Cogon including Brgy. 31 Health Center towards Daumar St.
3. Nazareth Subd. and Ramonal Village. From Hayes-12th Sts. towards 12th-21st Sts. ; along 21st St. from 12th St. to Tomas Saco-6th Sts. up to corner 21st – 2nd Sts. 4. Along 21st St., Nazareth from corner 27th St. towards 20th,15th up to 14th St. including Asian Crystal Compound. 5. Along 14th St., Nazareth from corner 10th St. towards 11th, 12th, 13th, 23rd, 21st up to 26th St including Xavier University Grade School. 6. Along 15th St. Nazareth from corner 9th St. towards 10th, 11th, 12th, 13th, 23rd, 24th, 21st up to 26th St. including Barangay Hall, Tennis Court and Gym. 7. Along 16th St., Nazareth from corner 9th St. towards 10th up to 11th St.
8. Sari-Sari Stores at corner Capt. Vicente Roa – Hayes Sts. 1. Along Ramon Chaves St. up to Corrales Ave. and towards corner A.Luna St.
2. JR Borja Sts between Capt. Vicente Roa St. up to PNB/Everbest including Daumar St. to Yacapin Ext. up to Doña Nieves St.
3. Along Capt. Vicente Roa St. from De Luxe Hotel to Cogon Market up to corner Ramon Chaves St.